An attractive gate is an inviting addition to your garden and can be practical, merely decorative, or both. It can provide a welcome entrance for visitors at your front garden, or can be used to close off specific areas within a garden, such as a vegetable patch or swimming pool. A gate is also essential if you wish to prevent pets from escaping your garden. 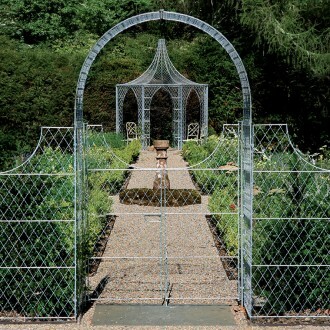 Our English wirework garden gates are designed to work with a range of trellis panels, so your gate can be laced with a climber such as a honeysuckle, clematis, jasmine or climbing rose to create a decorative feature of your garden as well as a practical one. The wire on our mesh panels is woven by hand using a very specialist skill dating back to the early Victorian period. Today, only a few craftsmen have the ability to weave to such a high standard. Watch our workshop team handcrafting metal garden trellis. Our gates can also fit within our garden arches to create a complete scheme of diamond latticework. Used with an arch, you can enhance an arbour over your front gate by growing climbing roses for a beautiful array that will last through the summer months.